Our client use a lot of VeriFinger 6.0 licenses that are installed on 500 PCs in 100 branches over the country. They implemented a software that help them to supervise IT infrastructure and they want to use it to create a database of activated matcher/extractor serial numbers related to specific PC. They possess a spradsheet with matcher/extractor serial numbers and want to verify whether correct licenses are used on specific PCs. Is it possible to decode matcher/extractor serial numbers from either id files or license files received from Neurotechnology using any of SDK application? it is not possible to get the serial number from the id or license files. SDK does not include any tools, which will provide such functionality. This can be done only by our company. If there is a need to find which serial numbers were used for license file generation, then send such license files to support@neurotechnology.com. If the amount of licenses is big, then it will take several days to process such request. please use the Activation Wizard and generate the "diagnostic". Send it along with the description of your issue to support@neurotechnology.com. sent file via email, which was submitted during registration to forum. Answered by e-mail. New licensing service sent. I am trying out the verifinger sdk components so that I can advice a potential client on whether to purchase a license or not. I have downloaded the 30 trial SDK and read the process to activate the product and done exactly that. However when I run the applications some of the libraries cannot be initialized because they can not be loaded. I used the diagnostic tool found in the ActivationWizardDotNetTrial.exe to check for the real issues. I found out that all the relevant libraries for Biometrics Finger Extraction have not be activated. I would be most grateful if someone could point out to me what exactly I am missing as soon as possible as I have very limited time to win this client. (Just for your information, I am an experienced VB.Net developer but would not mind C# explanation if that is what is available). We are trying to evaluate VeriSpeak SDK. We used several PCs and different locations (to have different Internet IP addresses) but are unable to obtain trial licenses. Can you please help us to resolve the problem? revoltex wrote: We are trying to evaluate VeriSpeak SDK. please use the Activation Wizard and generate the diagnostic and send it to the support@neurotechnology.com with the detailed description of the issue. I don't know why ? How can i fix this ? i don't know why and how to fix this problem? We've tried to run the file FingersSampleWX included in the SDK with Product revision number: 75615 . "Licensing manager is not running!" The service is up and running, we have licences available. What else is there to be done? Please generate diagnostics using Activation Wizard (if you are using Windows) or executing "sudo ./diagnostics_report.sh" from Activation folder (if you are using Linux) and send it to support@neurotechnology.com. Could not find file 'C:\Program Files (x86)\Neurotechnology\Neurotec Biometric 4.0 SDK\Bin\Win32_x86\Activation\LicenceUsage.log'. Any idea on how I can fix this? I'm using Windows 7 64-bit, although the project is compiled in 32 bit. Dim components As String = "Biometrics.FingerExtraction,Devices.FingerScanners,Biometrics.FingerMatching"
Error -200 means that it is not possible to obtain licenses. 2. You have all necessary licenses activated if running non-trial version of SDK. If you are using trial version of SDK, please make sure trial period of licenses is not expired (you can check it using Activation Wizard). 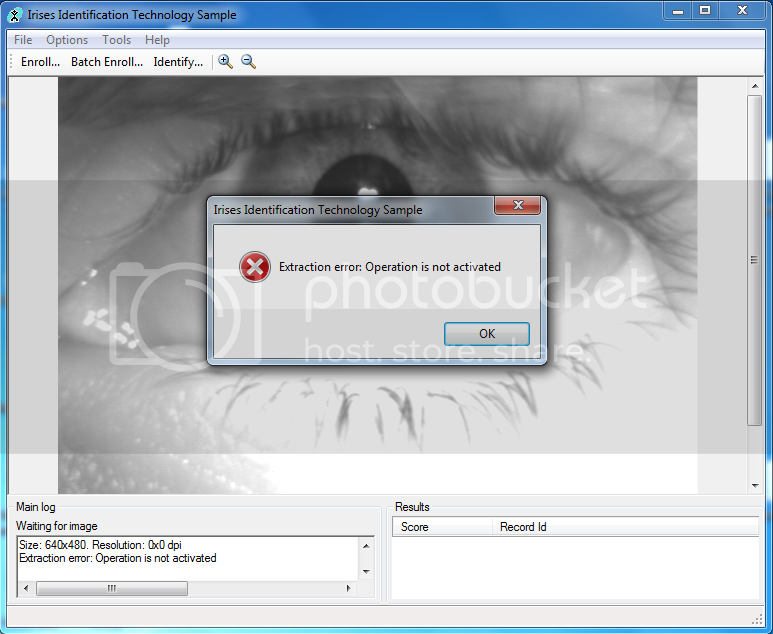 If you still have problems using our SDK or it's components please generate diagnostics using Activation Wizard, save it to file and e-mail to support@neurotechnology.com (do not forget to describe your problem). if you are using trial version of the SDK, then please generate the diagnostic with the help of Activation Wizard, located in the Activation folder and send it to the support@neurotechnology.com with description of your issue. Can I use Verifinger 6 Licenses and dongles with Verifinger 5? VeriFinger 6.x licenses are not supported in the VeriFinger 5. If the dongle contains licenses of the VeriFinger 6.x, then they are not supported too. I am wondering if it is a license issue and which is the right license to use. To be able to use NServer you need to have Server license file (to enable NServer) and at least one Matcher license (to enable matching) activated and licensing service configured to use it. So please activate matcher license and use server license file provided to you when you purchased SDK. Neurotec_Biometric_4_1_SDK_Trial installed on two computers. on one computer, writes that "license expired" on another computer everything is fine. What is the reason? please use the Activation Wizard and generate the diagnostic and send it to support@neurotechnology.com with description of the issue. customer care when i click on activate online. "Activation failed. Error: license for this serial numbers was generated too many times. please contact neurotechnology"
please help me out and tell me what to do,i bought this license very costly, why should one installed successfully and the other refuse to installed. please write the email to support@neurotechnology.com. Admin: copied to "Activation and Licensing questions"
We do not have any technical document on the concurrent licenses. I will explain it below in this post. license files has an extension ".lic" and are generated in the "Activation" folder. I just started working with the VeriFinger 6.3 SDK. I was able to get everything working and created a couple templates. Then it started failing. The problem seems to be that NLicenseObtain(N_T("/local"), N_T("5000"), N_T("SingleComputerLicense:VFExtractor"), &g_extractor_license_available); succeeds, but the available flag is always false. I tried restarting the machine to see if there might have been problems with the activation server since there were a number of runs of my test program that were aborted before calling NLicenseRelease. It did not help. Any help figuring this out would be appreciated. pbyhre wrote: I just started working with the VeriFinger 6.3 SDK. I was able to get everything working and created a couple templates. Then it started failing. The problem seems to be that NLicenseObtain(N_T("/local"), N_T("5000"), N_T("SingleComputerLicense:VFExtractor"), &g_extractor_license_available); succeeds, but the available flag is always false. please use the Activation Wizard and generate the diagnostic. Send it to the support@neurotechnology.com with detailed description of the issue. The error you get means that you do not have a valid license activated on the computer. If you use trial version of SDK maybe trial period is over. If you use non-trial version of SDK please activate license(s). There is Activation.pdf (located in SDK\Documentation) provided with SDK how to activate licenses or start trial version service. Please check it. We are testing the functions of the PGD service under Linux, and We noticed that the service starts even though a licence hasn't been granted, nor a dongle is connected. Licensing service on Windows does not check if license is available. Service is only started and that's all. The same is in Linux. You have to make sure you have licenses activated or dongle inserted before you start licensing service on any OS. I buy mega matcher sdk for a few month. I run abis sample and store fingerprint template in database server. I can enroll fingerprint . but when I match fingerprint , it will display error as “ unable to start identify”. Please let me known how I can solve this problem urgent. Admin: The error on the server-side screenshot is "Unable to start identify: -200", meaning that the matching component is not activated. Moving to "Activation and licensing questions". Removed links to the screenshots due to safety reasons. Please generate diagnostics using Activation Wizard, save it to file and e-mail to support@neurotechnology.com. Do not forget to describe the issue. What happens if I generate a license file for a computer, activate it and use it, but the computer breaks and I cannot access to it to deactivate the license? What's the process to follow in that case in order to restore the license? these situations are investigated separately, but finally the licenses are always recovered. If you will have such situation, please write to support@neurotechnology.com. Neurotechnology (support@neurotechnology.com) for more information. Pls, am trying to activate my license with ActivationWizardDotNet, but it's giving me this error; what can i do to get it solved? 2012-01-22 10:30:37 Requesting configuration from network..
2012-01-22 10:30:50 Failed to retrieve configuration from network, using default config. Could not find file 'C:\Program Files\Neurotechnology\VeriFinger 6.0\bin\Activation\LicenceUsage.log'. 1/22/2012 9:53:03 AM – Provided serial number is invalid. Please check the serial number and retry. 1/22/2012 9:58:50 AM – Licensing service installation succeeded. 1/22/2012 10:01:09 AM – Diagnostics generation started. 1/22/2012 10:01:13 AM – Diagnostics was generated. 1/22/2012 10:02:31 AM – No dongles connected. Please insert a dongle to continue. 1/22/2012 10:03:17 AM – No dongles connected. Please insert a dongle to continue. 1/22/2012 10:03:20 AM – No dongles connected. Please insert a dongle to continue. 1/22/2012 10:10:11 AM – Provided serial number is invalid. Please check the serial number and retry. 1/22/2012 10:11:17 AM – Provided serial number is invalid. Please check the serial number and retry. 1/22/2012 10:11:23 AM – Provided serial number is invalid. Please check the serial number and retry. 1/22/2012 10:11:30 AM – Provided serial number is invalid. Please check the serial number and retry. 1/22/2012 10:12:21 AM – No licenses selected. Please select one or more licenses to proceed. 1/22/2012 10:12:29 AM – Provided serial number is invalid. Please check the serial number and retry. 1/22/2012 10:12:39 AM – Diagnostics generation started. 1/22/2012 10:12:41 AM – Diagnostics was generated. 1/22/2012 10:12:58 AM – Text copied. Please email this text to Neurotechnology or your distributor. 1/22/2012 10:13:04 AM – Text copied. Please email this text to Neurotechnology or your distributor. 1/22/2012 10:14:08 AM – Diagnostics generation started. 1/22/2012 10:14:10 AM – Diagnostics was generated. 1/22/2012 10:14:30 AM – Text copied. Please email this text to Neurotechnology or your distributor. 1/22/2012 10:15:50 AM – No licenses selected. Please select one or more licenses to proceed. 1/22/2012 10:19:04 AM – Diagnostics generation started. 1/22/2012 10:19:06 AM – Diagnostics was generated. 1/22/2012 10:19:58 AM – Text copied. Please email this text to Neurotechnology or your distributor. 1/22/2012 10:22:57 AM – No licenses selected. Please select one or more licenses to proceed. 1/22/2012 10:29:21 AM – Provided serial number is invalid. Please check the serial number and retry. 1/22/2012 10:29:27 AM – Provided serial number is invalid. Please check the serial number and retry. 1/22/2012 10:29:32 AM – Provided serial number is invalid. Please check the serial number and retry. 1/22/2012 10:29:37 AM – Provided serial number is invalid. Please check the serial number and retry. 1/22/2012 10:42:15 AM – Diagnostics generation started. 1/22/2012 10:42:20 AM – Diagnostics was generated. Admin: merged duplicate topic to this post. wolexmerit wrote: Pls, am trying to activate my license with ActivationWizardDotNet, but it's giving me this error; what can i do to get it solved? As i see from our e-mail archive my colleague Povilas has already replied to you. So please use contacts he provided to you. please how can i purchase a single computer serial key for verifinger.